Tips to Clean a DuraCeramic Floor the Right Way! 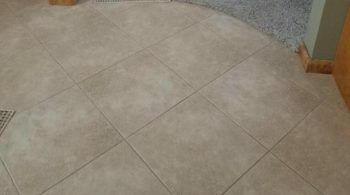 Here a few tips to clean a DuraCeramic Floor. For a more thorough cleaning, wash your floor with Congoleum Bright ‘N Easy No-Rinse Cleaner or other suitable, non-detergent based resilient floor cleaner. To restore the appearance, first use Congoleum Bright ‘N Easy Polish Remover to remove dirt and polish buildup. Secondly, use Congoleum Bright ‘N Easy Floor Polish or Congoleum Bright ‘N Easy Satin-Gloss Floor Polish depending on gloss or satin finish. DO NOT use polish on any DuraCeramic floors. Place mats at outside entrances to prevent dirt, grit and soil from being tracked onto your floor. Use 100% latex-backed mats, because some rubber-backed mats or carpets may permanently stain your floor. Draw drapes and blinds during peak periods of strong sunlight. For specific care and maintenance requirements, refer to your warranty information.